Saturdays are for TEAM RiverTribe at Skipping Fish Boat School (SFBS) this winter. The Louisville Community boathouse has briefly become a media center for the UCI Cyclo-Cross World Cup. It will reopen February 15, 2013. In the meantime, TEAM RiverTribe is meeting every Saturday at Skipping Fish Boat School. They’re building boats, carving paddles, cutting up and cleaning up. The youth leaders of TEAM RiverTribe are pioneering new adventures for all community youth by participating in a pilot program aimed at providing opportunities for all local youth to be introduced to paddlesports at the newly-opened Louisville Community Boathouse. Most of these youth paddle a traditional skin-on-frame Greenland kayak or “qajaq” that they constructed in previous years at a summer camp at Skipping Fish Boat School. This confident group of Greenland skin-on-frame enthusiasts or “Skinboaodians,” as they often call themselves, were an available, logical and practical solution to supply feedback on their wants and needs for a youth program. The youth of TEAM RiverTribe at the KFC Paddle For Hunger in Louisville’s first youth race, hosted by Skipping Fish Boat School in July of 2012. TEAM RiverTribe races, rolls, explores and camps out of their kayaks. They lead oneanother in physical conditioning exercises and participate in the adaptive rowing program run by Randy Mills and Paralympic coach Bob Hurley. 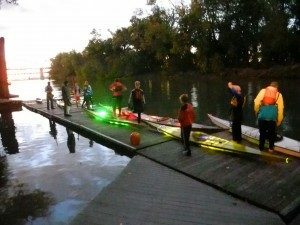 This past October, they illuminated their boats for a spooky night paddle, appropriately called TEAM RiverTribe’s Halloween Boat Glow. All this at the Louisville Community Boathouse! Skipping Fish Boat School & TEAM RiverTribe’s Halloween Boat Glow…preparing for their spooky night adventure. TEAM Rivertribe is led by SFBS Kimberley Hillerich, along with RiverTribe parents, Megan Sant and Morgan Ward, plus…the 2012 Nationals winner, Dave Long! They’re all volunteering their time at the Louisville Community Boathouse. 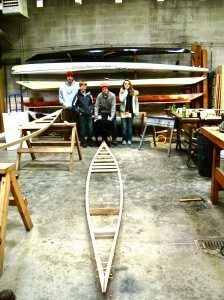 Four RiverTribe members at the stern of a new youth boat being built by youth on far right. 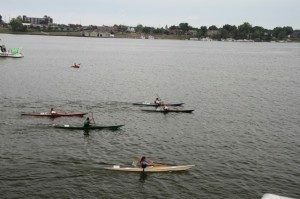 For more information on youth opportunities available through TEAM RiverTribe at the Louisville Community Boathouse, contact Kimberley Hillerich by email at skippingfish@gmail.com or send us a message from the Louisville Community Boathouse Facebook page. While you’re there, you’ll find plenty of reasons to “like” it.